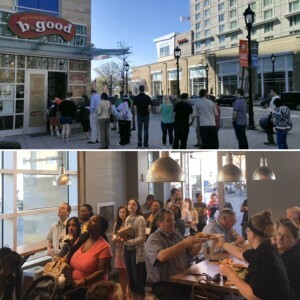 b.good, a national restaurant concept offering “real food fast” at 35 locations across the United States and Canada, opened its second Raleigh location this week – adding Fayetteville Street’s new Charter Square development to its local lineup that also includes a North Hills location (which launched October 2014). Pictures provided courtesy of b.good’s Steve Woodward showcase the returning seasonal burger for spring (flame-grilled, grass-fed local beef, ground in-house daily) called “The Goomba”. The pictured version of this dish is served no-carb on a bed of kale and sautéed veggies. 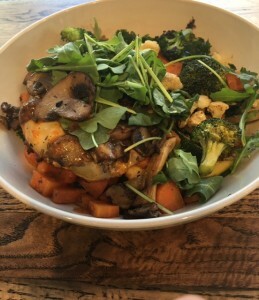 The Goomba is topped with smoked gouda, sautéed wild mushrooms, arugula, and warm rep pepper vinaigrette. 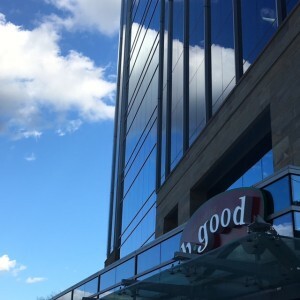 As with all b.good sandwich selections, The Goomba also is available as a natural hand-packed turkey burger, a house-made veggie burger, or as a grilled, all-natural chicken breast sandwich. 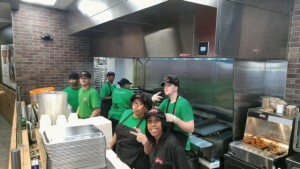 Pictures also feature a solid opening day crowd eager for additional fresh fare options for lunch in Downtown Raleigh. 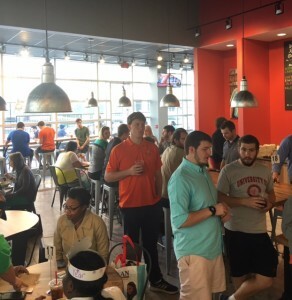 The Downtown Raleigh location menu also includes seasonal salads, kale and grain bowls, various sandwiches and burgers, milkshakes, smoothies, NC craft beers and hard cider, and “globally-sourced” wines. Hours of operation are 11:00 a.m. until 9:00 p.m., Monday through Sunday.